The Research and Consultancy Unit at Refugee Support, the refugee services arm of Metropolitan Support Trust, has launched its most recent research report Over Not Out: The housing and homelessness issues specific to lesbian, gay, bisexual and transgender asylum seekers. This groundbreaking research was launched at an event hosted by Baroness Gould at the House of Lords in Westminster on the 12 May 2009.
homelessness issues facing lesbian, gay, bisexual and transgender (LGBT) asylum seekers living in and returning to London. A project steering group consisting of representatives from Refugee Support, the United Kingdom Lesbian and Gay Immigration Group, Amnesty International and Stonewall Housing provided direction throughout the duration of this project. phase two focused on undertaking fieldwork, including: recruiting and training community researchers drawn from LGBT communities and principal refugee ethnic groups; undertaking 40 face-to-face interviews with LGBT asylum seekers, which included nine lesbians. The final phase of the project focused on refining the findings and developing policy recommendations. Discussions with the steering group and further interviews with 19 stakeholders were undertaken to test and refine the findings. A sample frame was developed for interviewees which included a larger number of gay and bisexual men than lesbians/bisexual women in order to reflect the greater number of men in the overall refugee and asylum seeking population. acute than for other asylum seekers. Thus, levels of transience in housing were high with 60 per cent of LGBT asylum seekers surveyed experiencing ‘hidden homelessness’ and either being forced to ‘sofa surf’ at friends, partners or casual acquaintances or living in multiple occupation housing. Further, interviewees were often forced to perform unpaid labour and sometimes sexual favours in return for accommodation. The precarious nature of informal living arrangements and the necessity of relying on the whims of others put many respondents in vulnerable positions where refusing labour demands would mean homelessness or destitution. Furthermore the traditional mechanisms of support for refugee and asylum seeking communities are not necessarily receptive to the needs of lesbian, gay, bisexual and transgender asylum seekers. Refugee Community Organisations that traditionally provide the backbone of support for refugee and asylum seeking communities can perpetuate negative attitudes from their home countries to LGBT asylum seekers. Additionally, many of these organisations are often led by men which means that lesbian and transgender asylum seekers would never contemplate accessing this support. Faith based organisations, both Christian and Muslim, may also perpetrate similar attitudes and prejudices regarding sexual orientation and gender identity. Experiences of detention highlighted additional concerns with respondents experiencing bullying, abuse and harassment by the detainees and detention centre staff due to their sexuality and/ or gender orientation. 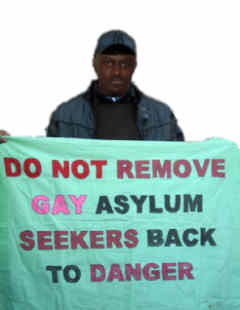 Sadly, as the report highlights, lesbian asylum seekers are seeking asylum in the UK on the grounds of their sexuality, but many are not able to disclose their sexuality or gender identity and are unable to be fully ‘out’, facing difficulties finding a place of safety away from hostility and homophobic discrimination. LGBT voluntary and community organisations need training and funding so they can meet the needs of asylum seekers. Public and charitable funders should provide more support and challenge Refugee Community Organisations (RCO’s) about the accessibility of their organisations to LGBT people. UKBA should review and refine the guidance and contractual requirements it imposes on landlords providing accommodation to ensure that LGBT asylum seekers are safe and can live lives free from homophobic or transphobic harassment. Third party reporting centres for hate-crime should be encouraged to develop awareness and support programmes for LGBT asylum seekers to ensure that they are aware of their rights to safety and the recourse they have. The full report and executive summary are available to download from the Refugee Support website.